Wireless communication can be a useful method to monitor the electrical machine as it provides the main characteristics of online signal processing. Our contribution in this current paper consists in studying a new system to monitor the rotating electrical machines based on wireless communication. The main objective of this system is to detect the temperature value of the squirrel cage induction machine’s rotor, using the IEEE 802.11 protocol. However, the application of wireless communication inside the rotating electrical machines is not self-evident due to the fact that the electromagnetic compatibility problems between devices isn’t obviously guaranteed. So, in order to obtain a good reliability for wireless communication, the study of the electromagnetic field inside rotating electrical machine is essential. As a first step in this paper, we are going to focus mainly on the flux effect of the rotating electrical machine through the finite element method which offers so much information on the phenomena characterizing the electrical machine operation. This method proves that the high frequency domain transmitter won’t be disturbed by the low frequency existing flux inside the machine. As a second step in this study, the proposed network system design is presented. Then, the communication protocol, the hardware design based on the transmitting chip Roving Networks (RN-171) as well as the software design are illustrated. Finally, the experimental results of the proposed system are investigated to validate its feasibility. 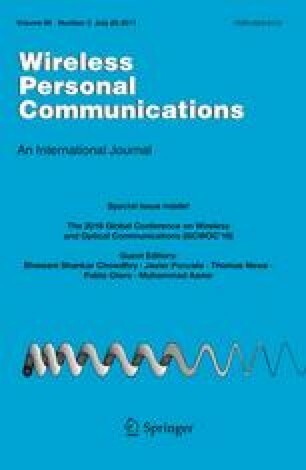 This work was supported in part by the Innov’COM Laboratory of Higher School of Telecommunication, University of Carthage Tunisia and LAPLACE Laboratory of the National Polytechnic Institute of Toulouse France.